There was an album with a bunch of crazy pictures from my vacation in the Poconos in my last post. There's one photo of me behind the wheel of a painted hippie 'magic bus'. It was just sitting in a field full of other crazy crap, behind the "world's largest general store", Country Junction. Here's a link to the original photo. This year my family went on our summer vacation, back to the house we stayed at last year. It's on a lake in the Pocono Mountains in PA & has become one of our all-time favorite vacation spots. Fortunately, the weather was great all week. The heatwave blasting the rest of the East Coast didn't really catch up with us until Thursday. Even the cooling effects of the lake can't stop 100º+ heat. I spent most of my time swimming, kayaking, fishing, or relaxing, with plenty of eating and drinking. We all take turns making dinner each nite which works out great. We all get along well, so vacations are always fun. With the family growing, it only gets more & more interesting. The only real activity we left the house for was to go to the world's largest general store/redneck amusement park, Country Junction. They have a gigantic store full of both everyday items & more bizarre stuff. One of our favorite things there is a mangy stuffed lion that's $25,000. There's also a full-size home theater area inside. Outside, they have a petting zoo/playground. 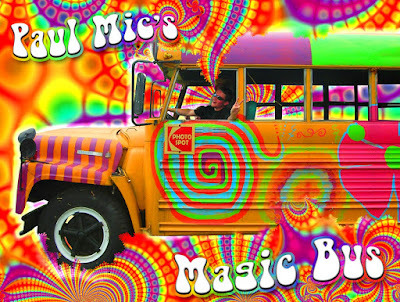 Behind the whole complex is a large field, with crazy stuff like a huge pirate ship, a "haunted house" that looks like it's inside a shack, and a psychedelically-decorated magic bus. My nephew loved playing on all the wacky crap there, but I was just amused by it all. I didn't go on any long nature hikes this year. However, I did make a couple trips to a trail (about a mile long) which leads to a cool waterfall. The first time was with my brothers & a friend, then I went back a couple days later w/ my sister's family. I went swimming in the water in the lagoons beneath the falls & it was bone-chillingly cold. Despite not seeing any rattlesnakes this year, there were a few water snakes living in the area of the dock behind the house. I felt like a Natural Geographic photographer, crawling in the shallow water by the shore to get a close photo of the snake. We found out they're not poisonous, but they're still creepy. I'm on vacation in the Poconos with my family this week. We always have a great time together & always enjoy our annual trip to relax, swim, fish, eat & drink on a mountain lake. I try to stay offline for the most part while I'm up here, especially since there's so much other stuff to do. However, I'm posting some pics of the lake behind the house, until I get home & upload more photos. Here are a couple views from the house we're staying at. There's a pic of the lake during the day & also of one of the beautiful sunsets over the mountains. I only have one more full day here, but we've had an awesome week so far & I have alot more great photos. This past week, the Dalia Lama has been in Washington DC to coincide with his 76th birthday. He has also presided over Kalachakra ceremonies, consisting of extensive spiritual teachings. These are once-secret teachings give insights into the microcosm of the human mind & body and the relationship to the macrocosm of the Universe. 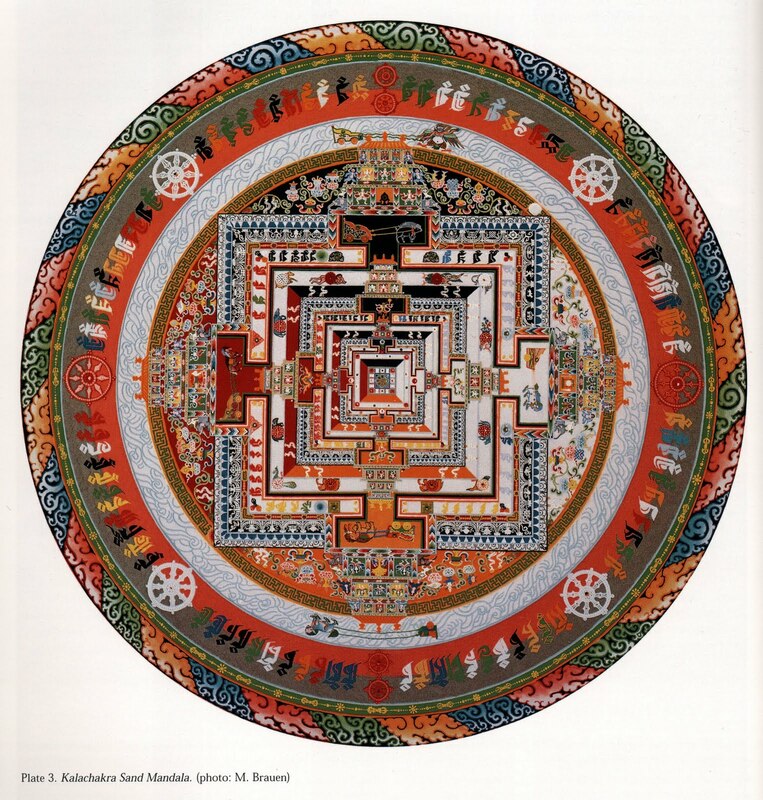 The culmination of the Kalachakra is the creation & destruction of an intricate sand mandala, representing the Wheel of Time. There are many aspects of Buddhist thought that have greatly influenced my view of the world. In particular, I have always found the creative process of the mandala to be a profound expression of transient existence. 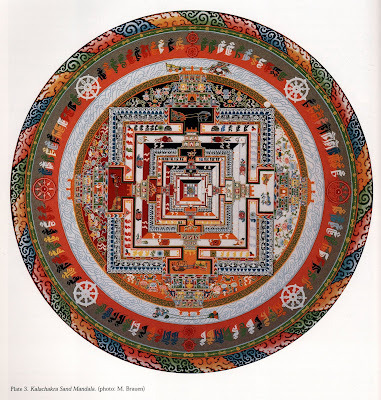 Kalachakra Mandala from peacefeather imagery on Vimeo. Deliberately dismantling such a dedicated, detailed work is a contemplative symbol for the impermanent nature of all reality. 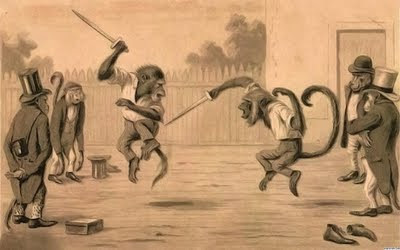 Of course, this is not related to the decadent superhero-sponsored monkey knife fight. 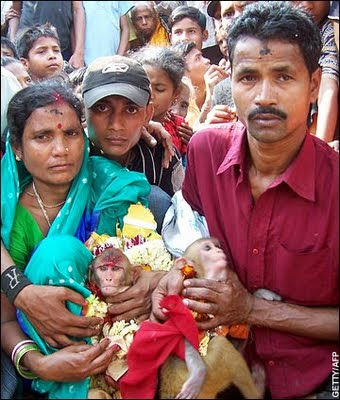 "Monkey Wedding Draws the Crowds in India"
so, if a slightly ridiculous human ceremony made that happen, all the better. As I previously noted, China has also taken the leap into the magical world of monkey weddings. After the Bush years, when the Republican-controlled Congress was led by the likes of Majority Leader Denny Hastert & the infamous Speaker-turned-felon Tom Delay, it's hard to imagine any worse. However, the current group of GOP leadership has turned out to be inept beyond belief. The Republicans in Congress are unwittingly doing Obama a favor by making him look like the only guy in DC trying to get things done in a reasonable manner. I watch this stuff closely (for some reason)... & try to objectively see the points of views I disagree with. During these lengthy 'negotiations' on the debt ceiling & the budget, the Republicans have been defending the indefensible, though. Of course, nobody wants to raise taxes on lower incomes, but to say that no new revenues can be raised by any means... is just not realistic. Minority Leader McConnell, House Speaker Boehner, & Eric "Bet Against America" Cantor have openly dedicated themselves to the cult of Grover Norquist's government-drowning fantasies & people are seeing the real potential for disaster. Even though there is alot of political theater going on, it can affect people's lives in real ways. They've acted like they are ready to play chicken with the debt limit & the American economy, in order to continue catering to the very wealthiest entities in this country. Turtleman McConnell has blinked, though, & is now taking some heat from his angry base for showing his true lack of resolve. So, instead of purposefully solving America's problems, the GOP leadership have clearly been playing political brinkmanship to pander to the ideologues. Debt-limit Increase is Obama's Problem"
For Potentially Profiting From U.S. Default"
GOP's priority is 'defeating Obama in 2012"
Unfortunately, Mitch McConnell's priority isn't creating jobs, or solving America's many crises. Hopefully his constituents realize that soon & get him out of the Senate. He's unbearable to watch in interviews & speeches. Cantor's a close second. 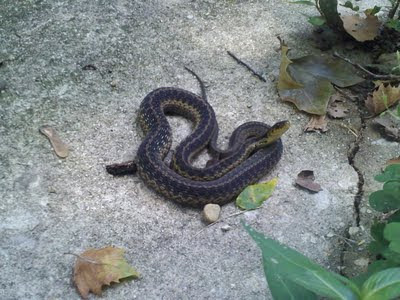 This weekend I walked out onto my back patio to eat lunch, & I saw this garter snake laying in the sun. Instead of scaring it away, I let it sit there a few feet from me while I ate. It just stayed motionless & watched me the whole time. They are crazy looking creatures. I also got a more close-up photo below. I asked him to tell his rattler buddies in the Pocono mountains to leave me alone when I go hiking up there on vacation! To counteract the NASTY photos on my last post, I'm now posting a more serene view of nature. Below is a photo I took last weekend, during my 3-day 'Independence Weekend Extravaganza'. On Saturday, I stayed at a house right on the bay in Pleasantville, NJ. I ate and drank like a king all weekend. After my trip to the shore, I went to my the annual cookout/crabfest with my friends on Sunday. Then, my parents grilled on the 4th. Tonight, I was over my parents' house, & my brother was leaving to go to the gym. Despite the wetness of the rainstorm, I threw on a pair of sandals & quickly followed him outside. As I was walking out, my witty brother said, "I think we have a mutant out here." Looking down in the front walkway by the garden, I saw what looked like a freaky snake creature with 2 front legs. He must have seen the look of pure bewilderment on my face, & I looked closer after he told me... it was a snake swallowing the backside of a frog!!! It was gross, fascinating, awesome & absolutely horrible- all at the same time. I'm glad to see it's not just stupid dirty hippie 'liberals' like me who see how wrong the ultra-conservative right-wing fringe have been on just about everything dealing with meaningful public policy. 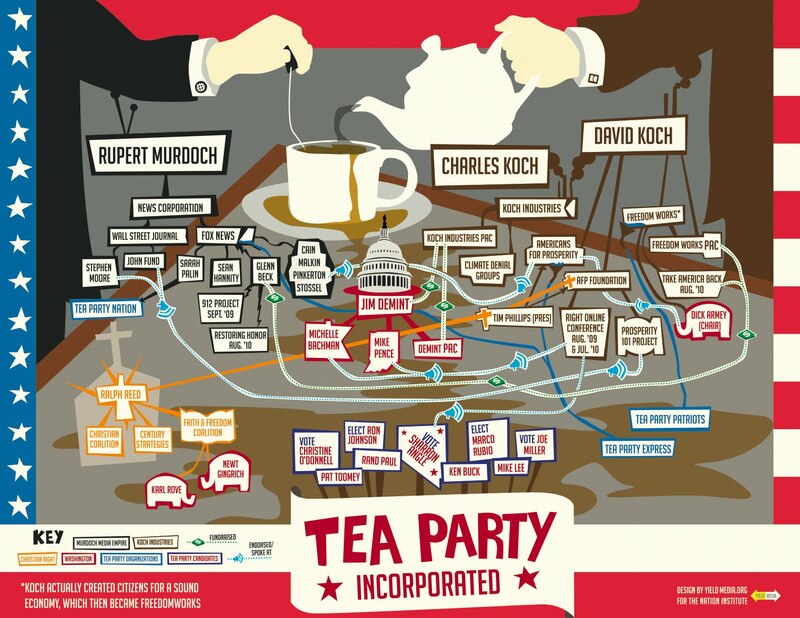 Rational conservatives are beginning to realize that the reactionary Teabaggers (unwittingly guided by corporate interests) have been driving the already incompetent GOP into political insanity. that is represented by the Republican Party today." the stupidest constitutional amendment I think I have ever seen. It looks like it was drafted by a couple of interns on the back of a napkin. Every senator cosponsoring this piece of sh*t should be ashamed of themselves." commenting on the Republican's balance budget amendment. In honor of the birthday of this great country, here's some words of wisdom from one of the few sensible people in the madhouse of Congress. I'm referring to the Independent Senator from Vermont, Bernie Sanders.